All the students from Waipahu HS that submitted proposals. April 16, 2018: Nearly a month after our previous awards ceremony on Molokai, we visited Waipahu High School to award their first ever telescope time. 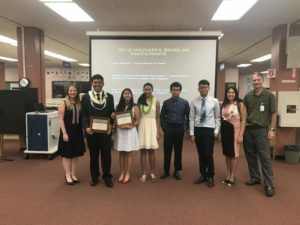 In their inaugural year, Waipahu students exceeded expectations and submitted four world class proposals, including two that received telescope time. Waipahu students are also the first to receive telescope time on the 10meter W.M. Keck Observatory atop Maunakea. “The addition of the Keck Observatory this year means that Hawaii high school students now have access to four of the largest telescopes in the world; Keck I and II, Gemini North and the Subaru Telescope” said Mary Beth Laychak, outreach manager at the Canada-France-Hawaii Telescope and program coordinator for Maunakea Scholars. The students worked with two graduate student mentors from the University of Hawaii’s Institute for Astronomy, Anna Payne and Christian Flores Gonzalez. The mentors guided the students, taking their fledgling ideas and working with them to craft astronomical proposals. “The graduate student mentors from IFA are an essential part of this program. We learned early on that graduate students working with our high school students is an ideal mentorship for this program” said Doug Simons, director of the Canada-France-Hawaii Telescope. “The planet with Two Suns” by Laura Daclison. Laura was the first student awarded time on the W.M. Keck Observatory and will use the telescope to study Kepler 35b, a binary stellar system with a planet in a stable orbit. “LBV and Wolf Rayet Stars” by Jean Claude Dumaslan. JC will use the Canada-France-Hawaii Telescope to study luminous blue variable stars and their relation to Wolf Rayet stars. Laura and JC plan to work on their projects over the summer and present them next school year at the science fair. We are looking forward to seeing the results of their work.